ambient guitar music by whispersinspace: Line 6 Helix vs "All Those Pedals"
Line 6 Helix vs "All Those Pedals"
So, a fellow ambient guitarist pointed me to the Line 6 Helix guitar processor. One pedal does it all. I use a pedalboard, laden with 10 pedals, 7 of which are Strymon, etc. Lots of money on good cables, etc. You get the picture. 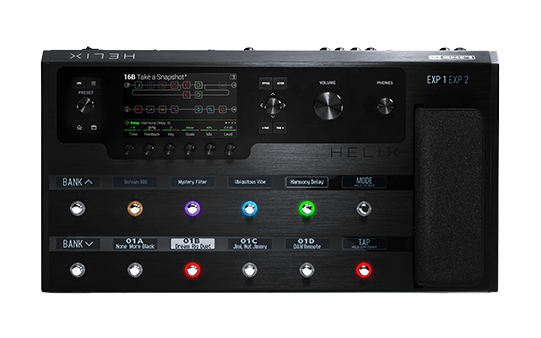 So I researched this Helix, and wow, it has great reviews, and the sounds I'm hearing on YouTube are very good. Price new=$1,500. eBay maybe $1,100. This thing is really well-designed, with about any connector on the back you'd want. It has 4 effects loops, so you can insert delays/reverbs/whatever and place them anywhere in the chain. By accounts, the effects are very good, (as good as Strymon? I'm sure not.) The amp modelers are very good, but all reviews recommend adding Ownhammer IR's ($50-$100) on top, after which the amp/cab sounds are by all accounts pretty great. To me, the "pros" are: one stop shop; I can transport this rig far easier than my overflowing pedalboard; I could sell a lot of pedals and have a net savings of maybe $2k after buying the Helix; I would spend less time futzing around with my Mobius and Timeline settings or moving a reverb physically in front of a delay to try out a new idea; I'd have a lot more choices (after which I'd probably select only one or two) for amp/cab sounds as I go direct to my pc interface now. I would hope this would allow me to be playing and making more music. Also, after I become more adept at ambient guitar, I'd like to be able to perform live, whether it's for friends who say "show me something", or for my family, or at a coffee-house or art-opening, etc. Has anyone seen the demo of Andy Othling's "live performance rig" that he now uses? Holy cow, it is unfathomably complicated (not to mention expensive) for him to play his music. (Not comparing myself to Andy, just saying, to get changes in settings during a piece, instead of tap-dancing, he's got midi controllers driving a switch on the pedalboard that turns on and off pedals, etc.) So the Helix would allow a guy like me to play live, without a lot of gymnastics. Another advantage: it's a lot less expensive (did I already say that?)! The big thing I think I'd appreciate though is simply the ability to store all the settings that I've finally dialed-in into a pre-set "scene". I always seem to spend an hour or two trying to "find a sound I like", and then when I power down, it's basically lost and I have to find it again. Really seasoned ambient guitarists, (Andy Othling, Monochrome Seasons, The Monk By The Sea, etc.) probably know their pedals so well that they can dial up the sound in their head quite quickly. I doubt I'll ever get there (and I've been working on this pretty hard for about a year.) Plus this is a hobby for me; I'm not trying to build the state-of-the-art ambient studio here. The "cons" of the Helix: you don't get best-of-breed effects. My guess is that in a straight-up comparison of say, Strymon Hall Reverb to the Helix, I'd prefer the Strymon. But not by a huge margin, and not a show-stopper difference. (I'm not a "tone-phreak": It's not as if know the exact tone I want and nothing else will do. I just know what I like when I hear it, I'm flexible.) I'd probably be giving up a lot of "engines" in the Strymon pedals, like the "Lo-fi", "Filter", "Ice", "Duck" on Timeline delay, which I don't know if I'll ever use anyway. (On the other hand, I can always keep say, the BigSky or the Timeline and run it through the effects loop pretty simply.) I won't know until I've tried it whether it will pass my "it's gotta have really low noise" test. Haven't seen any comments on this. Plus there is some chatter in forums about overloading the dual DSPs, but I think that chatter comes from newbies not setting up their signal chain effectively. These last two would come from a test-drive in my studio, which makes buying it on eBay a little more risky than, say, getting it down the street at Guitar Center where I can try-to-by real easy (at a cost of an additional $400.) Not sure there are other cons, yet. P.S. Made the pitch this morning after coffee to the budget committee, (Mitzi! ), and got the green-light to get the Helix. Love that committee.